“V-901 SOUTH ENTRANCE TO NATURAL TUNNEL, SHOWING THE APPROACH OF A MIGHTY SOUTHERN RAILWAY DEISEL ENGINE, NATURAL TUNNEL, VA.” Yeah, they misspelled “diesel”. The Natural Tunnel, located on U.S. Highway 23, 14 miles west of Gate City, Virginia, in Scott County, is said to be the only Natural Tunnel in the world used by a railroad. Through it the Southern Railroad has hauled many million tons of coal from the rich deposits of Southwest Virginia. 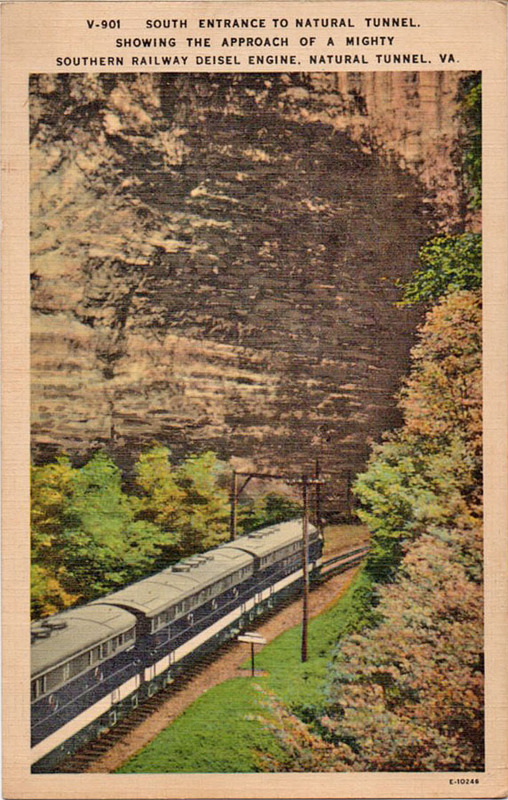 Published by Asheville Post Card Co., Asheville, N.C.